Chelsea host Liverpool in the Premier League on Sunday knowing only a win will keep their outside chance of qualifying for the Champions League alive. 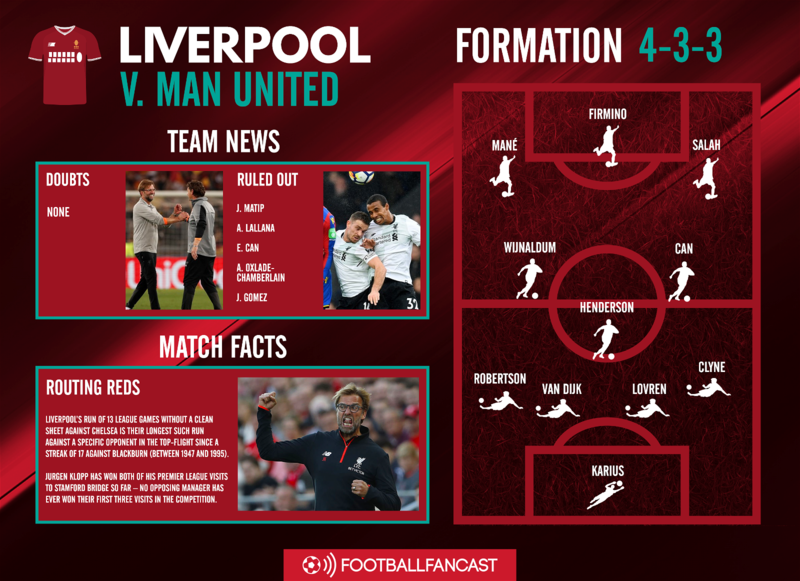 The Reds, meanwhile, know that just a point will clinch their place in Europe’s top competition next season barring an unprecedented turnaround in goal difference during the final few games. It represents something of a Champions League shootout then, although Liverpool will feel confident of grabbing the points they need against Brighton at home on the final day of the season if they don’t pick them up at Stamford Bridge. Quite incredibly, from their 51 Premier League meetings to date Chelsea and Liverpool have won, lost and drawn precisely the same number of games with 19 victories apiece. The Blues will argue they’ve performed somewhat better than the former during those encounters though; they’ve scored more goals and kept more clean sheets, albeit suffering twice as many red cards in the process. 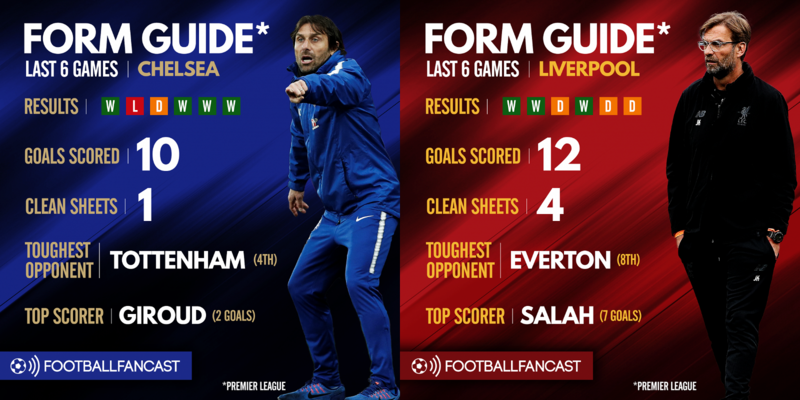 Likewise, Chelsea have beaten Liverpool more times than they’ve failed to at Stamford Bridge – a ground where the Anfield outfit’s win rate is less than 25%. But the Blues haven’t actually beaten Sunday’s visitors in the Premier League since 2014 after claiming three victories on the bounce, a run that has seen them draw 1-1 four times and lose twice. Who enters this fixture in better form almost depends on your interpretation of what that means. 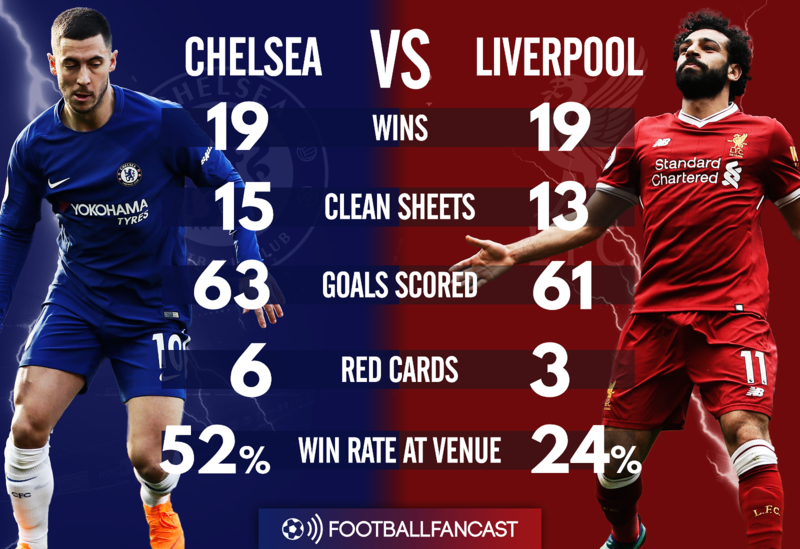 While Chelsea have claimed more wins than Liverpool during their respective last six Premier League outings, the Reds haven’t actually lost in that time – their last top flight defeat was to Manchester United at the start of March – whereas the Blues were beaten by London rivals Tottenham at Stamford Bridge. But Liverpool haven’t faced the most formidable of competition, their highest ranked Premier League opponents being Merseyside rivals Everton. They also failed to beat relegation threatened Stoke last time out, and were held to a 2-2 draw with bottom-placed West Brom. In terms of goalscorers, meanwhile, although he didn’t produce much against Roma on Wednesday night or the Potters last weekend, former Chelsea man Mohamed Salah has averaged more than one goal a game during Liverpool’s last six outings. Chelsea, on the other hand, have been forced to depend on six different goalscorers netting once apiece, alongside Olivier Giroud who has bagged two. 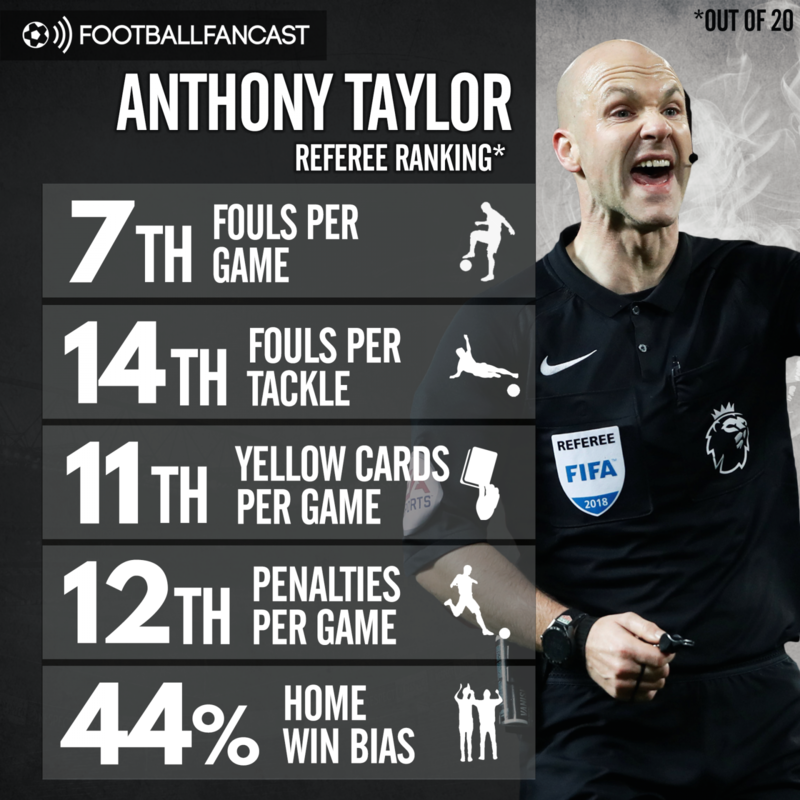 Alongside Michael Oliver, Anthony Taylor is probably the strongest referee the Premier League boasts at this moment in time. There’s real authority about the 39-year-old and all of his returns this season, ranking between seventh and 14th from the 20 referees to work in the top flight, reflect a healthy balance between avoiding needless decisions and making the important ones. That should ensure a fair contest on Sunday that isn’t decided by a moment of controversy from the man with the whistle. Perhaps the worrying news for Chelsea though, is that less than half the games Taylor’s officiated this season have ended in home wins. Only victory will do for the west Londoners this weekend, but Taylor’s season thus far suggests that’s more unlikely than likely. While Chelsea’s 1-0 win over Swansea City last weekend wasn’t wholly convincing, we’re expecting Antonio Conte to stick with almost exactly the same lineup, with the exception of Marcos Alonso – who Transfermarkt value at £31.5million – returning to the starting XI following his three-game suspension. Emerson Palmieri has performed well in his absence but the Spaniard has been one of the key lynchpins in Chelsea’s system under Conte since the start of last season. 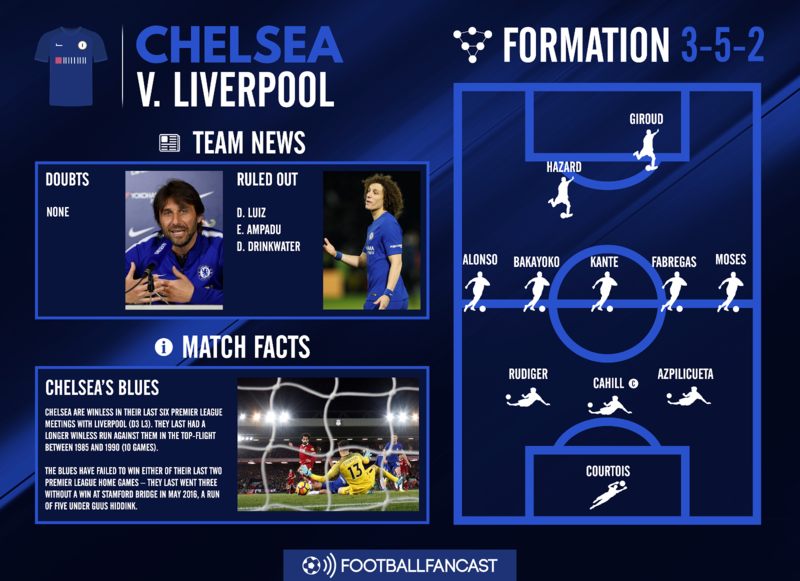 And it’s likely the Italian will stick with the same shape from last weekend, chiefly because it sealed Chelsea a crucial point at Anfield in the reverse fixture earlier this season with Eden Hazard in a free role just behind a central striker. The Belgium international created five chances that day, including the assist to Willian, and completed ten dribbles. Likewise, although Jurgen Klopp could ring the changes after an exhausting clash against Roma in midweek, victory this Sunday will seal Liverpool’s Champions League status with a game to spare and the German gaffer will likely be keen to keep the momentum going heading into the Reds’ European final. Once again then, the only predicted change is on the side of defence, with 14-cap England international Nathaniel Clyne potentially coming in for Trent Alexander-Arnold. The youngster was exposed at times by Roma and it shouldn’t be forgotten that Clyne had established himself as one of the more dependable full-backs in the Premier League before his lengthy injury layoff. He played the entirety of the Merseyside derby and has picked up minutes from the bench since then, so should have recovered some of his match sharpness.